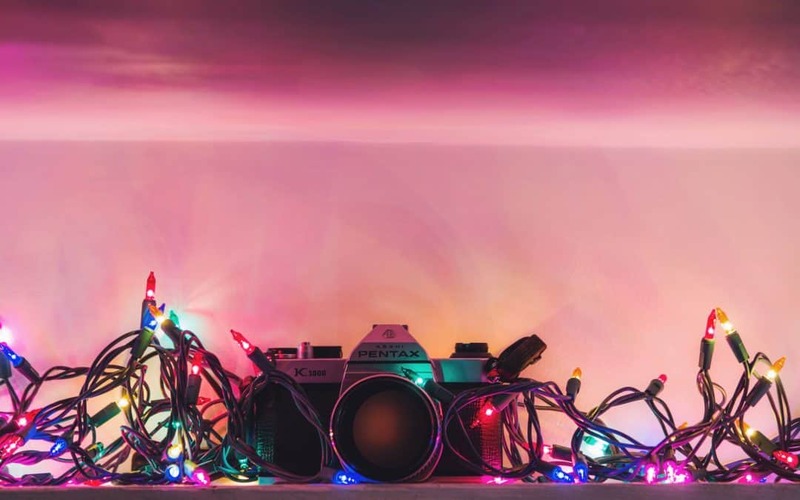 Christmastime (and winter) is the most energetic and exciting time to take photographs for a variety of reasons – the natural elements, the captivating and imaginative decorations (including Christmas lights) and the festive mood that overcomes whole communities. You can photograph during the day, but some of the most evocative images can be found at night. The brilliance provided by the pure white snow adds some challenges, but there are some benefits too. The cold chill of winter brings a certain purity to the air. Even the light usually has a different quality to it. This is all great for your photography. Get out in the brisk air and take photos of the snow-covered homes and lawns in your area. Most neighborhoods have several families that nearly go overboard with their enthusiasm for the season and have decked out their homes with intricate lighting and prop arrangements – these make excellent backdrops for your photos – seek these out. Holidays are days that highlight the importance of relationships, with Christmas being the granddaddy of them all. The stress and pressure of the passing year may wear on everyone, yet everyone is glad to relax and spend time with family. The joy of the “giving season” amplifies your subjects, so they’ll be more expressive when you ask them to pose together. Fathers and daughters, mothers and sons, brothers, sisters, husbands and wives will all be open to suggestions on how and where to stand to enable you to capture the bonds between them. Try to get them to smile and laugh; and suggest that couples stand beneath mistletoe for a holiday kiss. Families come together at holidays, but not just for the main event, they come to help decorate… and these are exciting, fun-filled moments, so they’re ripe with photographic opportunity! Trimming the tree is a special moment in creating the atmosphere of Christmas, and most families have a cherished collection of ornaments, lights and stockings – all of which need to be hung on the tree. Try to get people’s faces as they open the ornament boxes. Young children (who might not have remembered the last Christmas) are especially good subjects. All pictures of people soar when you focus in on your subject’s eyes, and that’s no different with Christmastime photos. It’s critical to compose the image with as little headroom and dead space on the sides as possible, so the image is more about the faces and the eyes than anything else. The rest of the décor will filter into the image on its own. In the photograph on the right all the eyes are in the same plane, and this is effective for this kind of photo as it shows a subtle unity among the family. You can use a flash with most indoor Christmas photos, but use a detachable flash (or an angled flash) and bounce the light off the ceiling. Christmas photos can have dual uses – you take them for the memories/record-keeping and you can use them as your family’s Christmas card. 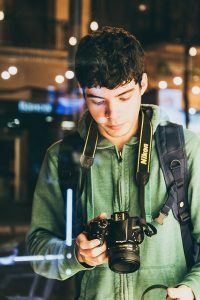 Either way, you want to make sure that you, the photographer, are in some of the important family photos. You’ll want to position everyone by the Christmas tree and have some presents in the composition too. Use a tripod for this group shot, because you’ll want to use the camera’s timer so you can get in the photo too.